in Leaf spray pattern on larger needles. 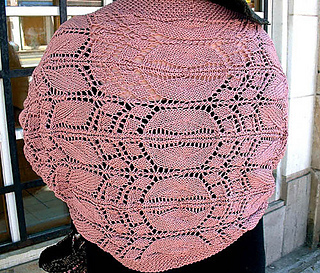 There are rewards to working a favorite lace pattern in a worsted-weight yarn: The pattern grows quickly before your eyes, and the larger-than-usual motifs ad drama to an otherwise understated garment. 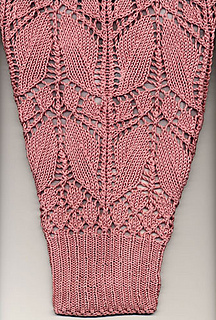 Lisa Daehlin’s lacy shrug showcases a warm, shoulder-cuddling merino. Each half of the shrug is worked on two needles from the center back to mid-sleeve, then joined and worked in the round for ribbed cuffs. Take care to block the pieces gently to preserve the dimensional effect of the leaf motifs.